Once the core of the rural community, the village shop has now almost entirely disappeared from everyday life. This well-loved British Institution was a key part of life for rual communities, once stocking everything from Atora shredded suet to Zebra grate polish. The village shop became a victim of accelerating social and economic change. 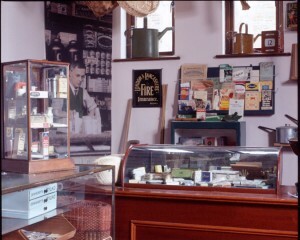 Visit our 1940s shop complete with haberdashery, stationary and gardening goods as well as food. The shop also contains a currant cleaning machine, a bakers cart, a coffee grinding machine and scales you can use to measure out quarters of candles and nails!